Mike Sullivan announced that Evgeni Malkin will be out for at least the rest of the week. The way Sidney Crosby is playing, Geno can take his time getting healthy. Crosby enters tonight's game with points in 11 straight, goals in 7 straight, and a 9 game home goal scoring streak that's the longest in the league since Mario Lemieux scored in 11 straight home games during the 1995-96 season. It's a Metro Division battle on Rivalry Night as the Pittsburgh Penguins take on the New York Rangers, and at stake is a potential 4 point swing for the Penguins as a regulation win brings them within 2 points of the the Rangers for 2nd place with a game in hand. It's the first of 4 times the two teams meet this season, and the season series is likely to go a long way towards determining the pecking order behind the Capitals in the Metro. Malkin won't be the only big name out of the lineup. New York will be missing both Rick Nash and Ryan McDonagh when they take the ice in Pittsburgh. McDonagh suffered a concussion on a gloved punch from the Flyers Wayne Simmonds, and his absence could potentially devastate what's already a weak blue line in New York. Nash has been out of the lineup with a leg injury, and it's been an up and down time with the Rangers for the former first overall draft pick. After averaging nearly a point per game in the lockout shortened season, Nash's production fell of a cliff in 2013-14 as he managed only 39 points. He rebounded in a big way with a 42 goal season last year, but through 45 GP this season Nash only has 12 goals. He'll be 32 heading into next season, and it's not out of the question to wonder how much production Nash has left in him. 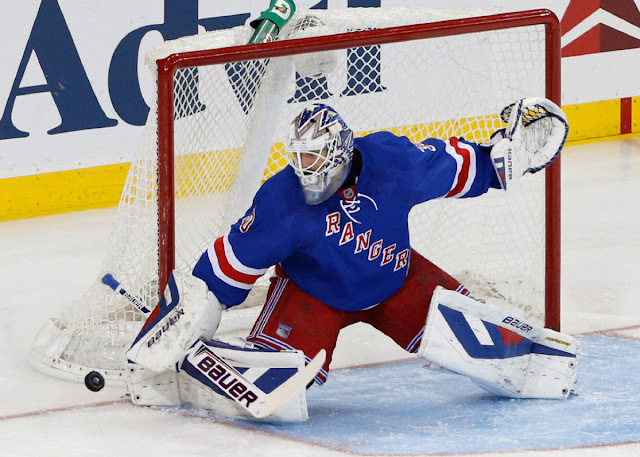 With the injuries, the Rangers will need to rely on Henrik Lundqvist even more than they normally do. It's a testament to the high level of play that Lundqvist has maintained that his current 0.921 SV% and 2.37 GAA are some of the worst numbers he's had in years. It's a great "problem" to have, especially for a team that's 5th in the league with 2.83 GF/gm. That being said, there are some problems looming under the surface that questions the strength of this Rangers team. The strength of the Rangers' offense rests on a league leading 9.3 SH% at 5-on-5, including a league best 102.6 PDO. The numbers suggest that New York has more than its fair share of puck luck, and it's helped them as they're 18th in the league with a score-adjusted 49.0 CF%. Frequent linemates Derick Brassard and Mats Zuccarello lead the Rangers with 18 goals apiece, though Brassard leads in points 40 to 39. One of the bigger surprises has been the play of J.T. Miller. Miller, who played his youth hockey in Pittsburgh, has 17 goals on the year and is on pace to score 26. The 22 year old forward has solidified his place in the New York lineup after bouncing between the NHL and AHL the previous 3 seasons. - Sidney Crosby has been on fire recently, with 22 points in his last 11 games, but it's hardly uncharted territory for the Pens captain. A hat tip to Adam Gretz on the stat, but Sidney Crosby had scored an absurd 31 points during an 11 game stretch in 2010. Making things even more impressive is the fact that Crosby was held pointless in two of the games. - Carl Hagelin scored his first goal as a Penguins Monday night against the Ducks after previously notching 5 assists in his previous 8 games. He'll have the chance to face another former team tonight. Hagelin spent the first 4 years of his career with the Rangers, scoring 58 goals and 72 assists before being traded to Anaheim in the offseason for Emerson Etem.